Dubbed the Fine-Comfort Ride, the premium saloon is slightly shorter but wider and higher than the Mirai and can achieve a cruising range of more than 600 miles on the Japanese JC08 test cycle compared to around 400 on the same cycle for the Mirai; an improvement of some 50%. It also emits no CO2 or “substances of concern” when driven and has a hydrogen refuelling time of around three minutes. 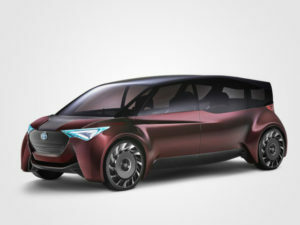 The six-seater concept also makes use of its fuel cell layout to offer a flexible layout, with wheels positioned right at the corners of the vehicle thanks to the use of in-wheel motors. The resultant diamond-shaped cabin brings increased space for the second row seats as well as aiding aerodynamic efficiency. Toyota has not revealed any production plans for the concept. The brand will also showcase a bus that can serve as an emergency power supply at Toyko.